South of Africa presents another enticing promotion just in time for Spring 2016! Guests who book select roomtypes at any of South of Africa’s hotels and cottages for stay-over on any Sunday during September, will pay unprecedented rates that will not be repeated. • If you are planning to stay at any one of our properties on a Sunday night in September, then this offer is for you. • Every Thursday before that weekend’s Sunday, a special rate will be made available online for that upcoming Sunday (for example, on Thursday 1 September, the special rate for Sunday 4 September will be made public). • This reveal will only occur on the official Facebook pages of the South of Africa properties, as well as appear in the Facebook feeds on their official websites. • Guests can then proceed in booking the upcoming Sunday night’s accommodation at a ridiculously low price. • BONUS DISCOUNT: Members who have signed up for South of Africa’s rewards programme (click here to sign up now!) will be eligible for an additional 20% discount on the already discounted prices for that specific Sunday night’s stay when they use their promocode on the official SOA booking portals!!! Note that any new members who sign up on the Thursday, Friday or Saturday prior to the upcoming Sunday will only be granted membership status the following Monday (this also includes signing up on the Sunday itself). However once signed up, your membership status will allow you to book the next Sunday’s special rate with your 20% discount added. Sign up now! 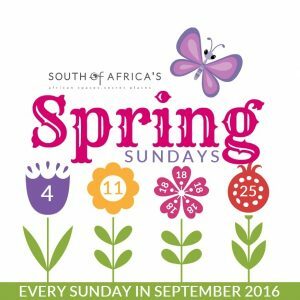 • The valid dates of the Spring Sundays promotion are: Sunday 4 September 2016 (announced Thursday 1st), Sunday 11 September 2016 (announced Thursday 8th), Sunday 18 September 2016 (announced Thursday 15th) and Sunday 25 September 2016 (announced Thursday 22nd). The Spring Sunday promotion is only valid for online reservations. Call in / e-mail requests will not be honoured and guests will be referred to the online booking platform. The Sunday night rates are only applicable to that specific Sunday that is announced the Thursday prior. The rates may differ every Sunday. The offer is subject to availability and applies to select roomtypes only. Rooms may not be held in advance so as to offer fair availability for all potential guests.